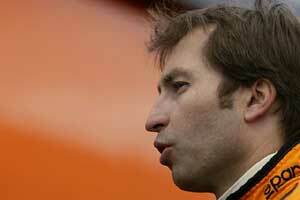 Frentzen to replace Massa at Indy? Heinz-Harald Frentzen will test the Sauber C21 for the first time Thursday at Silverstone and may replace Felipe Massa at the US Grand Prix at Indianapolis. Frentzen is too large for the car, and it was thought that the German would not get in the car until it could be modified, but Felipe Massa's penalty at the Italian GP, which will be assessed at the upcoming USGP, may have changed that. Peter Sauber said, "The decision of the Stewards of the Meeting in Monza to relegate Felipe by 10 grid positions at the Indy race forced us to think about alternatives. This verdict would be a major setback in our quest to defend our position in the Constructors' Championship,"
Frentzen will replace Massa in the team next year, but if he is able to be competitive in the small chassis this week at Silverstone, he could replace the Brazilian next weekend. "Only the test in Silverstone will finally show, whether Heinz-Harald will be able to drive competitively in this seating position. All further decisions will depend on the outcome of the test drive," said Sauber.